The study I conducted was an attempt to increase the relevancy of art for students by creating a lesson that was DBAE in nature which is a holistic approach and elevates art as a means of communication. To determine whether my changes had any impact I compared my results with DBAE to the same project I had given earlier with only art production and little to no instruction. I used content knowledge and thinking rubric designed specifically for an artwork and an agency rubric with an emphasis on student ownership. In addition, I wanted to get a sense for how students felt about the changes so did a student survey after the project. 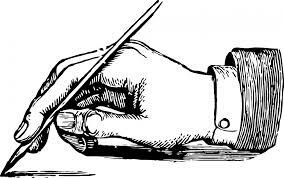 If you would like to read the results from the survey go to my research page to read my Research paper. 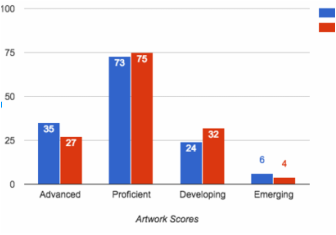 On the right is a chart of student levels after completing the art project the first time. Blue is the content knowledge and thinking and red is agency focussing on student ownership. 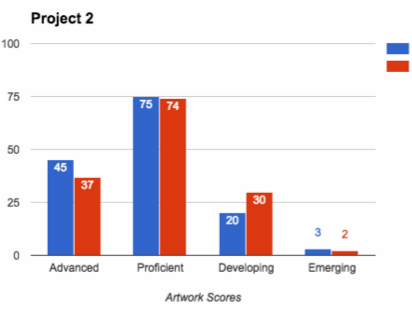 On the left is a chart of student levels after completing the project with technology and the DBAE format. ​Again the blue measures content knowledge and thinking while the red is student agency specifically student ownership.